You are here: Home / general / Cutest K-Cup Storage Rack Ever! 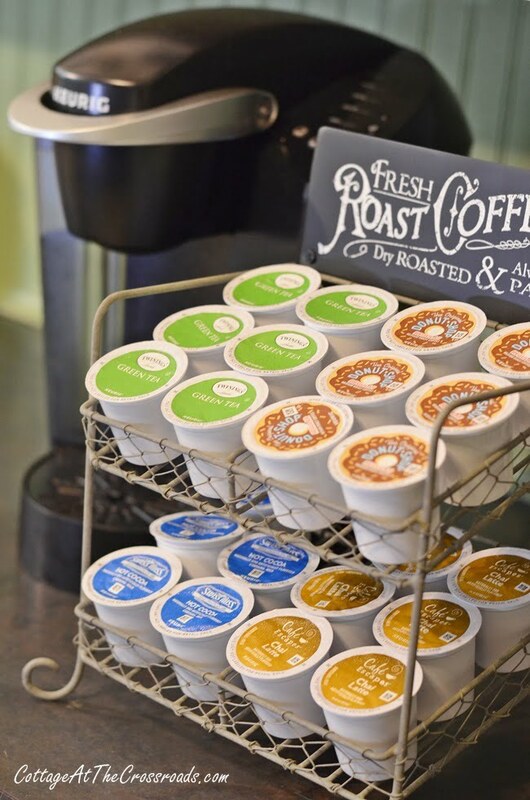 Do you have a Keurig coffee maker and wrestle with where to store your K-Cups? 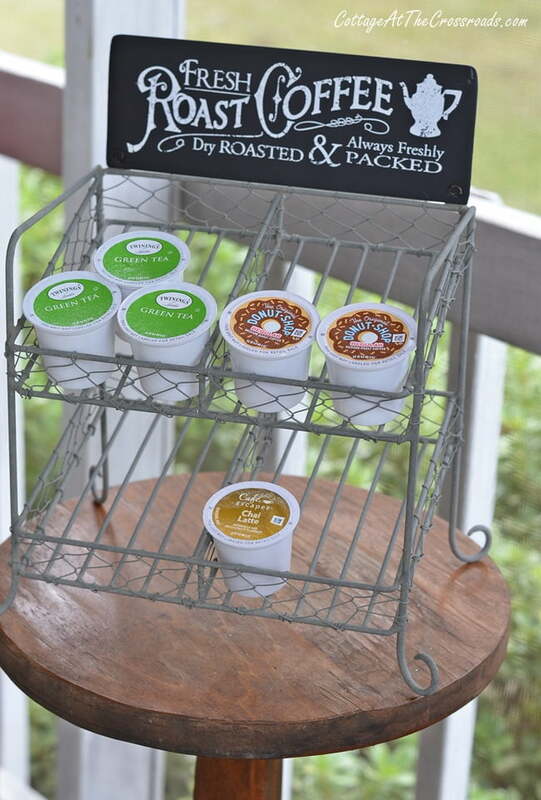 In this post, I’ll show you the cutest K-Cup storage rack you’ve ever seen! A few months ago, our coffee maker died and we replaced it with a Keurig. Leo and I are big coffee drinkers but we felt that we were wasting coffee since we were brewing two pots a day and not drinking all of it. We had told ourselves that we would give the Keurig a try whenever the old coffee pot bit the dust. And we are loving the convenience and speediness of the single serve brewer! It used to be that I had to wait about 15 minutes for my coffee to be ready in the morning. Now I can have a cup almost immediately after rising. My first dilemma after purchasing the Keurig was figuring out where to store the K-Cups. Our kitchen is tiny and counter space is at a premium! I knew that I needed something that didn’t take up much space but would also fit in with my country farmhouse decor. About the same time I was trying to figure this out, my blogging friend Angie from Postcards from the Ridge sent me the cutest K-Cup storage rack from her online shop Emory Valley Mercantile. 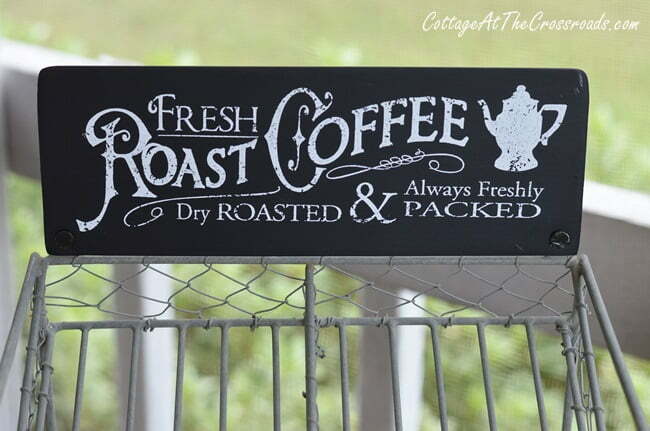 Its vintage style with the black and white coffee sign fits in perfectly in our country kitchen. This darling K-Cup storage rack holds 18 K-Cups, and I brought it outside to photograph so you could see all its details. Didn’t I tell you it was the cutest K-Cup storage rack ever??? 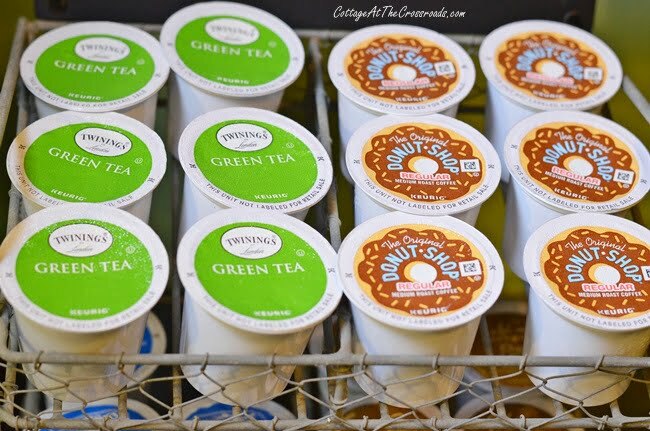 I like to separate the different K-Cups so that guests can choose their hot drink of choice. I’m still experimenting with different brands, and I would love to know your favorites. 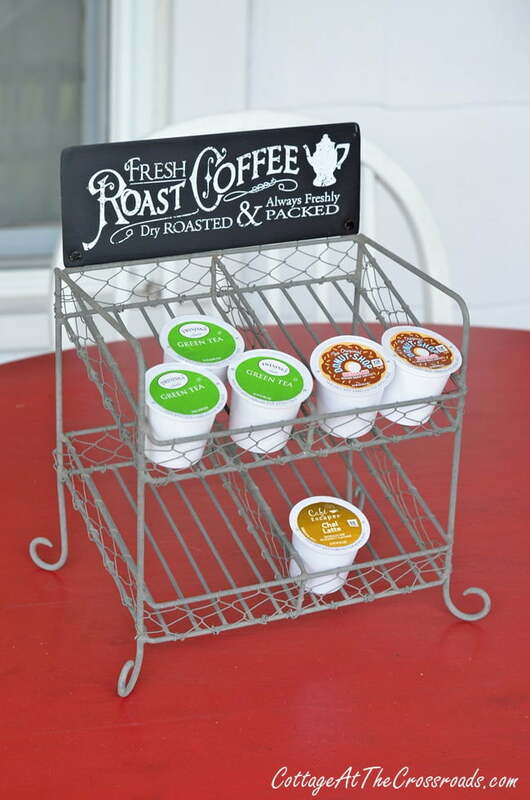 I’m sharing my affiliate link to this K-Cup storage rack just in case you’d like one for yourself or for someone you know who loves the farmhouse style. And since the holidays are approaching, check out Emory Valley Mercantile‘s wide variety of merchandise. If you subscribe to their emails, you’ll get a 25% savings code sent to you to use on your first purchase. 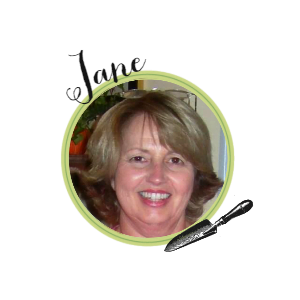 You should especially check out her gorgeous pillows that showcase her beautiful photography and artistic skills! Been wanting a dough bowl? Yep, she has those, too! 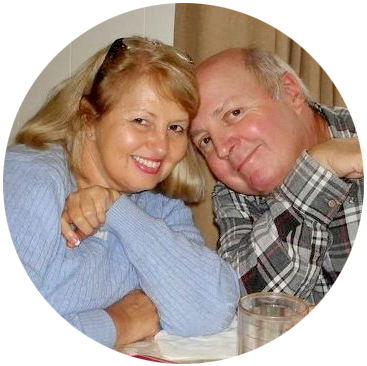 I ordered the container for the coffee it is so cute plus because of you my husband and I went to moon shine campgrounds to check it out we really enjoyed ourselves and I love the little town of Waynesville. I have the same K cup holder and love it. It is cute and functional too. Happy Tuesday. Yes, that IS the cutest K cup holder ever! Our favorite is Krispy Kreme! Cute rack, but unfortunately not in my budget! Oh wow…. Love this.. and thanks for the tip on this shop…. That is the cutest storage for K-cups! Our favorite is Folger’s Black Silk. Enjoy your new Keurig.